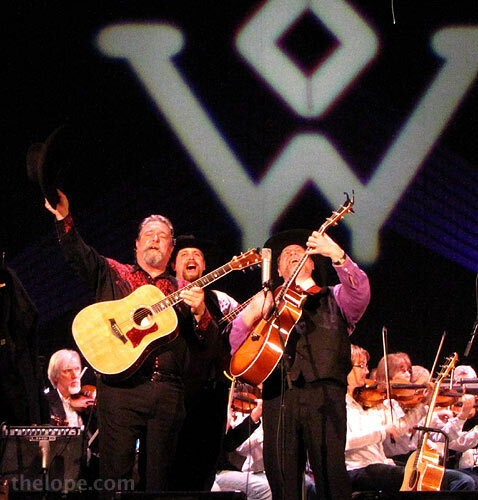 Cowboy music group, the Diamond W Wranglers will be part of Kansas: Home on the Range, a Kansas Sesquicentennial concert tribute presented at the Fox Theatre in Hutchinson at 2 PM on March 13. Other performers will include Judy Coder, 3 Trails West, Ann Zimmerman, Cowboy Poet Lariat Ron Wilson, Roger Ringer, Barry Ward, Dodge City Marshal Allen Bailey, the McPherson Children's Choir and the Hutchinson Symphony. This photo was taken last month when the Diamond W Wranglers teamed with the Hutchinson Symphony at the Fox. That's a lot of entertainment packed into a cool Art Deco theatre. Of course, you should go.